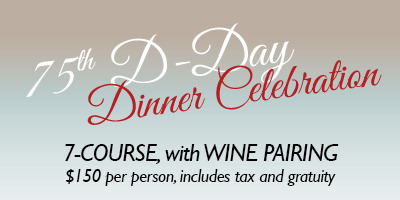 Join us for a delicious dinner celebrating the 75th D-Day anniversary, and honoring WWII veterans. With the support of: Charlotte French Honorary Consul Laura Meyer Wellman, The French-American Chamber of Commerce-Carolinas, Bienvenue Charlotte, the Alliance Française of Charlotte, the Charlotte-Limoges Sister City Committee. 7-course dinner, with wine pairing - $150 per person, includes tax and gratuity - Menu will be posted soon.